Also serving communities of Lino Lakes. There are 72 Assisted Living Facilities in the Hugo area, with 3 in Hugo and 69 nearby. The average cost of assisted living in Hugo is $5,222 per month. This is higher than the national median of $3,346. Cheaper nearby regions include White Bear Lake with an average starting cost of $4,100. To help you with your search, browse the 228 reviews below for assisted living facilities in Hugo. On average, consumers rate assisted living in Hugo 4.6 out of 5 stars. Better rated regions include Forest Lake with an average rating of 4.8 out of 5 stars. Caring.com has helped thousands of families find high-quality senior care. To speak with one of our Family Advisors about assisted living options and costs in Hugo, call (855) 863-8283. Just 21 miles north of downtown St. Paul, Hugo, Minnesota, is home to approximately 14,400 residents, of which 1,900 are 55+. For seniors seeking an assisted living facility in Hugo, there are 64 nearby, two in Hugo and 62 in neighboring communities, such as North Oaks and Mahtomedi. These facilities provide help with the activities of daily living as well as medication management and are regulated by the Minnesota Department of Health. Minnesota gets a healthy dose of snow each year, receiving exactly double the national average at 52 inches, and temperatures can dip into the single digits. This contributes to the city’s lower Sperling Comfort Index (43 out of 100, national average is 54). Other places might be better for seniors who have a lower physical tolerance for harsh winters. The national average for air quality is 58 out of 100, based on the National Air Toxics Assessment implemented by the EPA. Hugo ranks better at 63. This might reduce symptoms of or lower development risk for respiratory conditions, which are a common issue for many seniors. Living in Hugo will cost seniors a little extra, with the city ranking 115.2 compared to the national average of 100. This is something to consider given that most seniors have limited incomes, but housing is the biggest issue here, and many seniors might qualify for financial aid that can offset this expense. Unlike many other cities in the state, Hugo, Minnesota has a higher rate of violent crime (31.2 out of 100) compared to property crime (23.7). The national averages for violent and property crime, by comparison, are 31.1 and 38.1. Seniors might want to think about how well their selected ALF can provide more physical protections. Hugo offers a range of entertainment and culture activities seniors might enjoy like access to a golf course, ski trails, nature trails and tennis courts. Seniors also can visit the Lakeshore Players Theatre. Hugo is home to world-class medical facilities, including St. John’s Hospital and Fairview Clinics, in the event of medical emergencies or illness. Assisted Living costs in Hugo start around $5,222 per month on average, while the nationwide average cost of assisted living is $4,000 per month, according to the latest figures from Genworth’s Cost of Care Survey. It’s important to note that assisted living rates in Hugo and the surrounding suburbs can vary widely based on factors such as location, the level of care needed, apartment size and the types of amenities offered at each community. 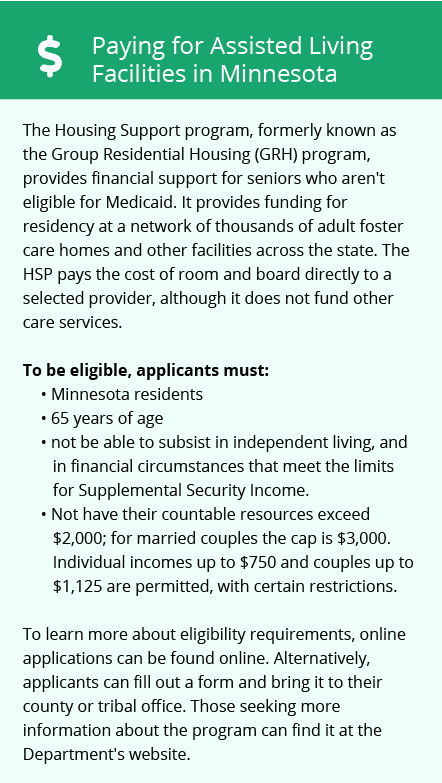 For seniors who need help financing their stay at an assisted living community, the state provides several options. 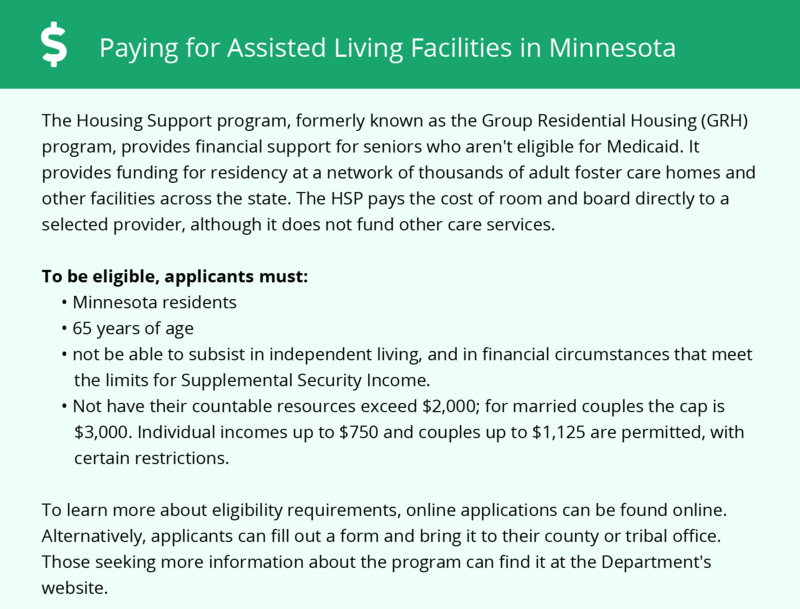 These include the Elderly Waiver and Minnesota Group Residential Housing Program. To see a list of free assisted living resources in Hugo, please visit our Assisted Living in Minnesota page. Hugo-area assisted living communities must adhere to the comprehensive set of state laws and regulations that all assisted living communities in Minnesota are required to follow. Visit our Assisted Living in Minnesota page for more information about these laws.